You may not be familiar with the company called Lifetime. ​But chances are, you own products that are designed and manufactured by them. ​When asked how Lifetime continues to thrive with design, engineering and manufacturing largely in the United States, long-term employee and Machine Shop manager Kelly Martinez (25 years tenure) says, “We have superior design engineers, and an entire team of employees that are dedicated to coming up with innovative ideas for new products and product improvements. We know that innovation isn’t a luxury - it’s a necessity for our growth.” Kelly continued, “Early on in our existence, we set up our own engineering department and our own machine shop. Since we do all of our own mold and tool and die making in-house (we even make many of the machines needed for our operations), we save time and money. In the past, when we’ve outsourced tooling to a 3rd party, the tooling time increased 2 to 3 fold.” With all design and manufacturing under their control, products typically move from design to production in under a year. New design ideas often come from the suggestion boxes that are installed throughout the Lifetime campus. ​The Utah-based state-of-the-art facility houses some of the industry’s most innovative equipment. Lifetime Metals is the region’s leading supplier of processed steel. From slitting and leveling, to roll forming, tube milling and stamping, their trained and certified staff manufactures quality, custom steel products at an exceptional value. ​• Reliability, accuracy, durability and ease of use. 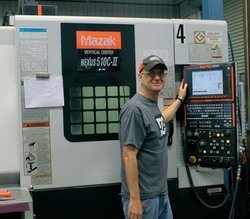 ​• Powerful Mazak controls equipped with both Mazatrol conversational programming and G-Code programming. ​• Outstanding service, both from Smith Machinery and Mazak direct. Kelly says Clark Smith, owner of Smith Machinery, and his team just care more about their customers than many other machine tool dealers. ​• Superiority in consistently holding the tight tolerances that Lifetime requires for their tool steel parts. 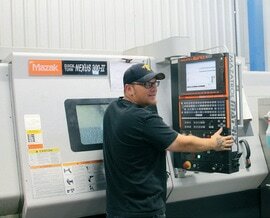 Lifetime’s machine shop largely manufactures products for its own use. But, Kelly says, “We support a number of external customers with our roll forming (odd shape, rounds, square), and our blow molding capabilities.” Contact Lifetime for your roll forming and blow molding needs today. They can be reached at: (801) 776-1532, and you can learn more about their outdoor living products at lifetime.com. ​In the beginning, all Barry Mower, founder of Lifetime Products, wanted was a sturdier basketball pole for his backyard. With this in mind, he found and purchased a piece of heavy-duty used pipe, a sheet of plywood, and a basketball rim. The result was a basketball standard for his backyard. That was in 1972. Seeing the potential that others might also desire a quality basketball system in their yards, he placed an ad in the “Big Nickel,” the local free classified newspaper, and made his first sale. The rest — as they say — is history. Not too many years after selling his first basketball system, he created the American PlayWorld company in 1973, which he based in his garage located in Riverdale, Utah. Gradually this store kept expanding into many more types of playground equipment, and was eventually moved to a bigger location in South Ogden, Utah. ​​Several years later, the company transformed the basketball industry with the introduction of the Quick Adjust basketball pole — the first complete basketball system you could raise up and down with a broomstick. In March 1986, a separate company was created to concentrate specifically on manufacturing adjustable basketball systems. This new company was named Lifetime Products, the name inspired by the goal of building a durable, lasting product.